Growing up, my parents didn’t play golf. So this meant no “hand me downs” from Dad, no tips and no custom golf clubs to get me started in a game they didn’t really know much about. The one thing I had going for me was when my family moved from New Jersey to Texas, my parents bought a house on the golf course. I still needed some clubs though, so when I would get my allowance from doing random chores I would have my parents take me to Golfsmith to buy used clubs. Due to insufficient funds at 8, I could only buy one at a time. I would take my new purchase out to the hole we lived on and learn how to use it. This meant around the greens, from the trees and as hard as I could hit it from the tee box. 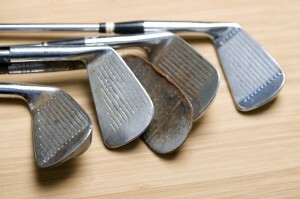 I eventually had a make shift set of clubs, but had a huge gap in my bag from sand wedge to 7 iron. When I went to try out for the Houston Golf Association (HGA) I had to hit a 75-yard shot on the green to pass. At the time I couldn’t get my sand wedge there so I had to figure out how to make my 7 iron go only 75 yards. I ended up passing the test to be a member of the HGA and eventually put together a full set. The point I am trying to make is so many parents get their kids a full set of clubs when they are first starting, which is good and bad. The good thing is they won’t create many bad habits with clubs that are way too heavy for them, but kids may lose the feel and imagination some of the legends of the game learned growing up in caddy shacks. So what I recommend is take out some of your kids clubs and have them play. Make them find a way to hit shots when they are in between clubs or don’t even have any wedges in their bag. They are young and will find a way to get the ball close to the hole. They will also learn the feel of adjusting their swing to get the ball going the right yardage. Trust me, if they ever play in a U.S. Open at Pinehurst, they will be thankful you made them only use a 5 iron around the greens when they were young. Keep it fun and keep them entertained!